Print professional single-sided cards with accurate color profiles and enhanced print qualities with the ID Maker® Advantage System. This all-in-one system comes with everything you need to start printing in 15 minutes, including the industry’s most user-friendly card creation software and the Advantage printer. Great for medium print volumes, the Advantage features a multi-card hopper and fast printing speed. It’s also compatible with upgrades like dual-sided printing and magnetic stripe. Logitech C920 HD Pro Web Cam Snap professional photos with this standard web cam. 10.1 MP Canon EOS Rebel T3 DSLR Get superior image quality by upgrading from the standard USB Cam to a 10 MP Canon SLR camera. ID Maker Pro 3.0 Software Easy-to-use ID creation software with enhanced user interface features. ID Maker Enterprise 3.0 Software Enhance the software to include networking, custom reports and live ODBC data-exchange capabilities. Printer Protection Bundle - ID Maker Advantage 3E Keep your ID Maker® Advantage Printer in tip-top shape! This protection bundle includes a warranty extension for a total of five years of total coverage, a cleaning kit, and a FREE protective printer case. Mag-Stripe Printer Module Upgrade Upgrade your printer capabilities! Encode onto a magnetic stripe to work with your own internal programs. Carrying Case Take your printer to off-site events and locations, or use it as a storage tool for your printer. FREE and FULL lifetime technical support and training are included. System includes: ID card printer, Logitech C920 HD web cam, mini tripod and white photo backdrop, 300 blank PVC plastic cards, 300-print YMCKO printer ribbon, and a printer cleaning kit. Includes ID Maker® Pro 3.0 software. Includes a three-year warranty with an extended warranty option. Compatible with Windows XP, Vista, 7, 8, 8.1, and 10. Weight: 23 lb. 4 oz. Great product and easy to use! Overall happy with the machine. The only thing I would say that I was a little frustrated with was that the colors on the computer were a lot different than the colors that actually printed on the card. The pictures also printed darker than was shown on the computer screen. Also, it was hard to get the logo formatted correctly so that it looked good on the card. I finally just called and had a technician from IDville do it. Overall the machine is convenient and easy to use and the staff was nice and helpful with all of my questions. I just love this machine. It took only a few minutes to setup and the quality is SO sharp. Now we have really professional looking ID's for all the volunteers at our church. 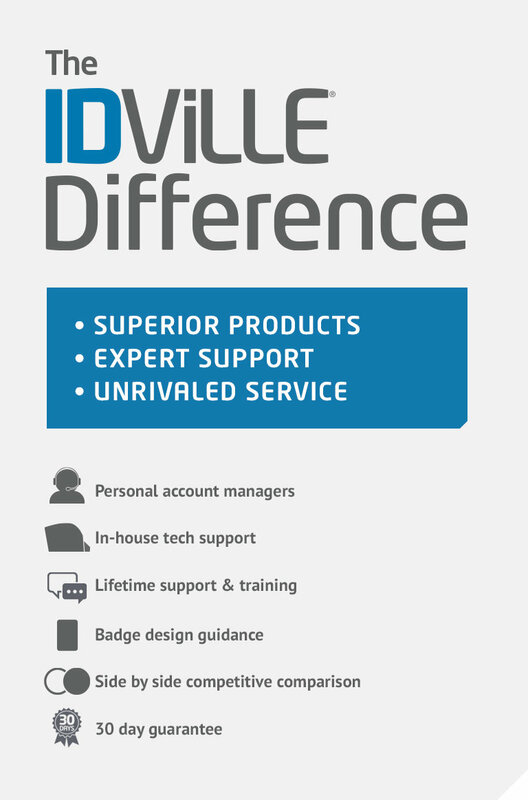 I totally recommend it---service with IDville is also GREAT. We LOVE our new ID Maker! We used to make our ID badges and training certificate card in-house. Using the ID Maker is much easier and way more professional. Easy to use, fast, economical - perfect investment for our 200 employee Non-Profit! Staff IDs are a cinch to create and look professionally done with the assortment of templates to choose from. USB Plug camera is very handy - no more photo downloads or flashdrives. Make multiple IDs at one time, and saves to a database - so that when someone loses their ID it is simple to reprint! We are very happy with this product and highly recommend it! Good Product, Easy to Use. The software and IDMaker were easy to install. We easily created our own card design and the database system was very helpful. Two drawbacks: we like our employees to physically sign their cards and we can't find a pen/marker that will stay without smudging or wearing off. Second, the printed picture quality could be slightly better. All in all, we're happy with our purchase. We use the product to adhere photo badges to our existing key card badges. Once set up properly, it's easy to use. The biggest downfall is the lack of a printed manual. This would help your customers. It took a bit longer to install and get going that advertised, but good. Would also be nice if the webcam was not stationary,and not the best quality camera. I really like this product because it makes creating name badges quick and easy. We ordered this product when we decided to switch to picture name badges. We used to order our engraved name badges which took a while to come in and being that we work in healthcare and it is a requirement to have a name badge on that timeline was not working for us. With this system it is easy to make a new name badge for a new hire or replace an employees that lost theirs. My only con with it was that the camera that came with it took dark grainy pictures but I switched to using a digitial camera and now they look great. getting the print settings right takes a few minutes, however, once they are set it does a great job. It's nice that you can use black or color print ribbon to save money when you are only doing black and white. We use the product for employee badges. It works as advertised. There is quite a bit of customization of badge layout, graphics and color, but more would be nice; company logo as a watermark for example. The included camera is very sufficient, perhaps only moderately more flattering than a passport photo and works well enough in normal office lighting. Printing a full color background over the stock white badge yielded uneven results - streaking. 3-in-1 hole punch worked great. Staff who work off-site and need to identify themselves will now have a professional looking product ID. Hunters who use our parks are able to be checked against approved lists and are easily identified. Teens who use our Recreation Center have approved membership ID. We had to compensate before with cut up and pasted on photos that were laminated on a hand-written ID card - not professional enough! We haven't used it enough yet to have any negative comments. This system works perfectly with our setup and we are very happy that we decided to go with this company as their support staff is very knowledgable. The text was blurry at first, so I had to call tech support and they had me change the settings on my computer and that fixed the problem. After that, the badges came out looking great! Loved how it went togeather and ease of use. Software needs help in making it easier to use. Would be nice to download other backgrounds. We used this ID maker for over 1500 IDs in just 2 weeks and had no major issues. It was a little harder to set up and use the machine than we expected. But after we got up and running, we were very happy with the purchase. This printer is a great tool for small businesses that want to ensure safety and security in their building. Just like the catalog said, "Ready to go in 15 minutes". Very easy to set up and use. Excellent for Child I.D. programs. Product is very easy to operate. There was an issue with the software after about a month of ownership, but IDVille technical support was excellent and sent a new copy of the software to us immediately. Our school uses mostly MAC's and there was nothing stating that it could only be used on the PC. IT was not very helpful. I would have liked to have known that you could import pictures from a different camera and did not need to purchase a camera with the unit. Overall I have been happy with the purchase. It is easy to use and the IDs look professional. IDs for employees, volunteers and childcare workers. Love the versatility. Setup instructions are very vague - computers ust have local administrative rights to use the camer which is not explained in instructions. Knowing I needed a "patch" to download for my operating system would have been nice. Still it a while to get used to it. Tech support was O.K. could talk a little less technical to customers. Now that I finally have things worked out and had some practice on the system seems to be working O.K. ID Ville Advantage ID Maker - Awesome! This little machine is awesome and prints beautiful IDs. I received it in just a couple of days from placing my order. We love it! Our company's ID maker is fantastic now that we have it working properly. This item is used to make IDs for students. It is efficient and the cards come out fabulous. We had difficulty at first getting things going and needed to contact support. The software that was sent with the machine was not updated. IDville support updated everything and now it works like a charm. I would recommend this product to any business or educational institution. We use this product to make ID badges for our Students on campus. The printer has been a blessing for us it prints with great quality and the fact that it tells you in what step it is printing on the screen is amazing. The most important thing for us as a school was to know that the printer came with cleaner cards. The only thing that was disappointing was the software that came with the printer. The software is difficult to manage with adding out school information and then when you use the software to print the badges the names have a shadow. If I had a way to fix the software the product would be perfect. This is saving us lots of man power, and computer ink. We were doing it from a template on the computer, then laminating . . . Once we got this machine set up we can now make season passes in less then 2 min a person. We cut payroll a our customers don't have to wait and return for their pass! We are a small operation, less than 200 people, and this id maker is perfect for us. The set up is SUPER easy, and the templates are nice to use. Printing quality is satisfactory, but could be improved-clearer picture quality and such. Great Way to Make ID's! We use the system to make pictured ID's for our employees. The system is quite easy to set up and to use. For some reason the software to run the webcam to take the pictures didn't properly install from the included software, so I just went to Logitech and downloaded that software for free. One other small issue was while installing the printer, a screen offered to update the printer firmware. At that time, the PC we were using did not have internet access. So, I hit "cancel" or "no" to the firmware update, and the installation seemed to abort right at that point. So, it wasn't clear if everything was properly installed or not. Also, I wonder if the Logitech webcam software was supposed to load after the firmware update, and it wasn't loading because I could not perform the firmware update due to the lack of internet access (hence forcing me to download it directly from Logitech.) Other than these couple of minor hiccups, the system is working wonderfully. The ID prints out in like 35-40 seconds and they are professional in appearance. Thank you IDVILLE for making an affordable, easy-to-use and professional ID making system. Our experience with it so far is excellent. We use this product for creating photo ID's for our Fire District Personnel. Nice, little machine. Prints good and looks professional. Thank you. We purchased this printer to create name tags for the students in our elementary school. It's easy to use. We were able to upload our database and create our template in minutes. We love the finished nametags! I have not had a chance to print anything yet. However the software is very easy to learn and set up. My only issue was the lack of templates and drawing tools. such as a square, line and circle. But I can always use clip art to create a design, just wish it was all in one place. Everything IDVille sells is overpriced. 2000 bucks to print plastic cards. Annoying is that sometimes on startup it will not print requiring a reboot. Another annoyance is that often on the first print it will improperly print the card thereby wasting it. Mine shipped without a card tray but that was corrected. The thing works, but it's expensive.